Meaghan: Tell us about your book! Eugenia: My book written with Abagael West and illustrated by Amy Gardiner. 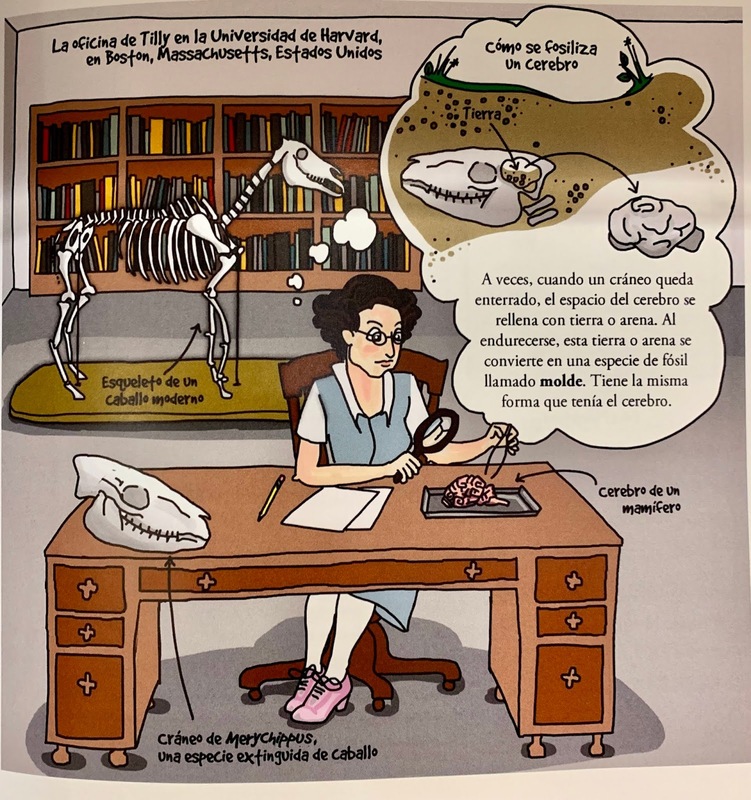 It is called She Found Fossils, and it's about women in paleontology through time and across the world in different professions of paleontology. 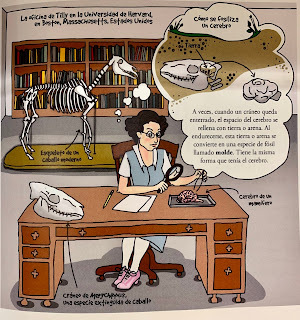 What we wanted to do is provide role models for kids all over the world to see that anyone can be a paleontologist. Where you were born, what color your skin is, or whatever doesn't matter - anyone can do it and that's what we wanted to show. M: And is it written for a particular age group? E: We targeted 8 to 12 year olds. There are some big pictures in there for 8 year olds, and some more text heavy stuff for older kids, too. But really anybody can read it and enjoy it. We hope. That was the goal! Amy: Was there a strategy for choosing that age group? E: Mm, more so that we wanted to hit a broad range that can enjoy the different aspects of the book and grow with them. Not really anything beyond that. Our girl Mary Anning is featured! A: Now we are going into more of your actual research so - what does a brain tell you about FLIGHT? And what does that have to do with dinosaurs? E: Oh it's very cool! So brains can change their shape based on how much you use different aspects of them. So if you're doing a lot of smelling the portion of your brain that is responsible for interpreting that smell will grow. But if you think about that on evolutionary time, if you are increasing the using different aspects of your brain for new behaviors such as say, flight, then the aspects of your brain that control that behavior are going to increase as you use that behavior more and more. 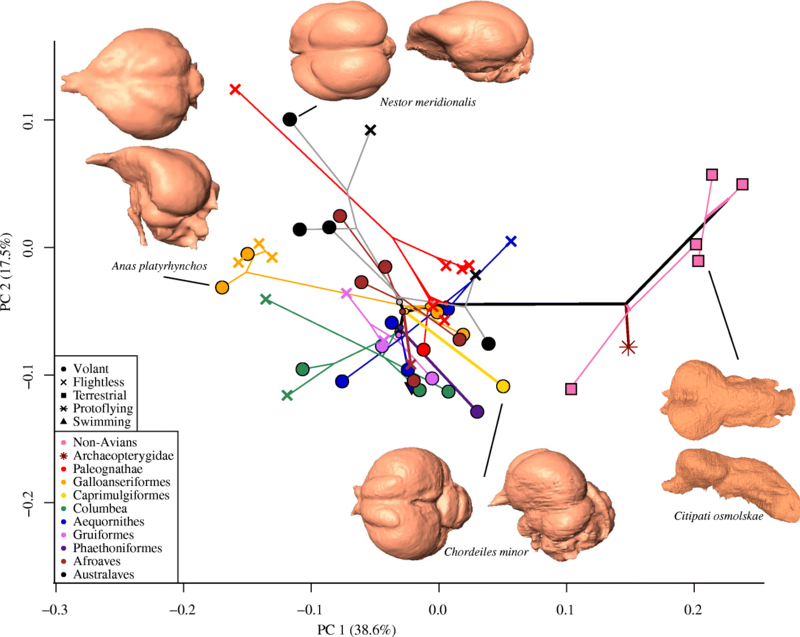 So what I like to do in my copious research time is look at brain shape changes along theropod dinosaurs, and see if we can see any differences in that brain shape as flight behaviors became more prominent. M: And what do you see? M: Yes, it is exciting, you’re right! E: *laughs, continues with admirable focus* The whole brain goes from being very linear to being very S-shaped, and you can see that throughout theropod evolution. Interestingly some of these structures are starting to appear early on - earlier than you would it would expect for flight. 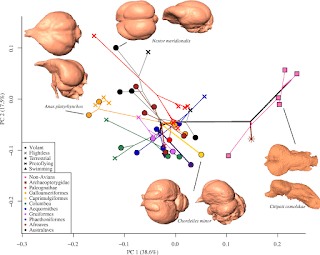 E: Amy Balanoff’s research shows that changes in volumes of the brain happened much further down the tree then flight, so raptors have a full avian-like brain in volume but in terms of shape, we see some structures are appearing around when flight might have started becoming a more prominent behavior! 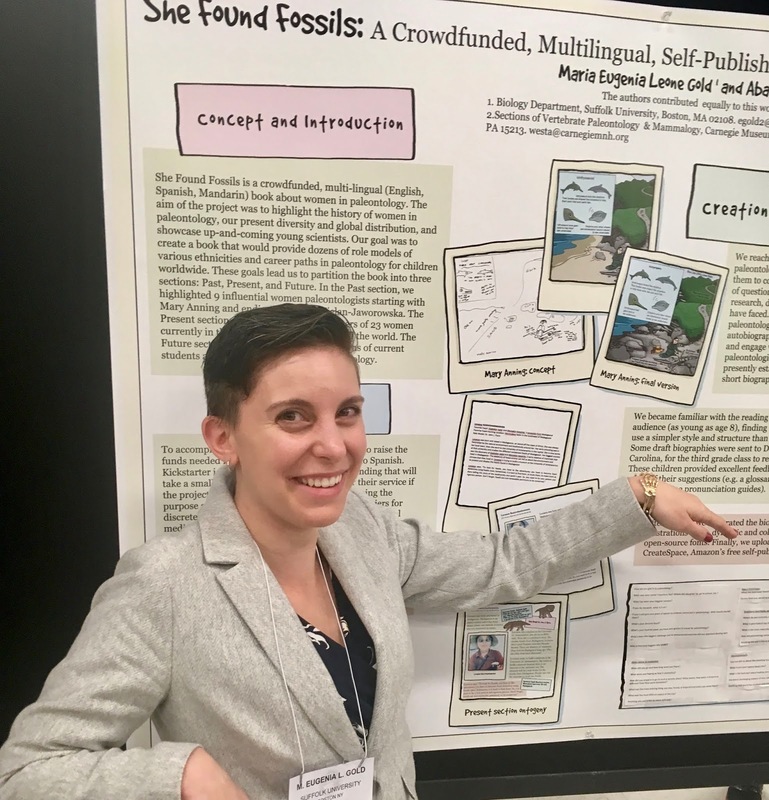 M: So Tilly Edinger is famous for her love of horse brains. Was that kinship part of what made you decide to write this book? E: Definitely a part of why I included Tilly, yeah. I didn't want to target things that were super close to my research but I definitely wanted a neuro person in there. Because reasons! M: So when you’re measuring brain volume - I know that Tilly did a lot of endocast stuff. She filled a horse skull, and then she took a look at the brain. 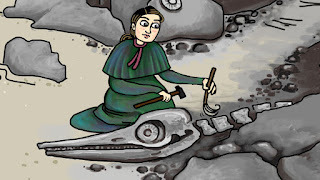 I don't feel like you could do a lot of that on birds skulls in the fossil record? E: Yes! So she would do it by actually physically filling in the brain case, and looking at the physical endocast. What we do now is CT scan and digitally fill in the skulls to get models of the braincase. 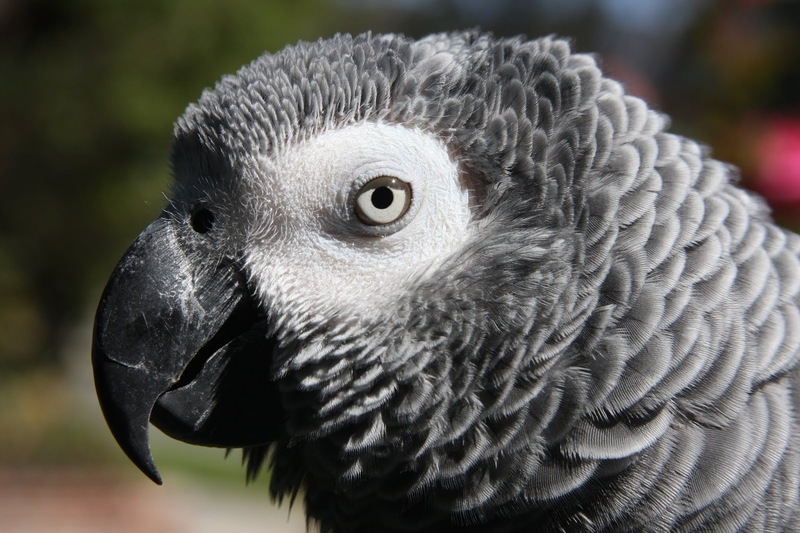 And that's pretty true to what the brain shape and volume is in modern birds, it’s that reliable. Until you go back further down the tree, because other structures start to fill in the brain case - fun structures - so you lose that reliability but for the most part through stem birds you have a pretty good representation of what the brain looks like. A: Which is also like painstakingly slow. E: It can be, depending on the preservation of the skull. The modern stuff is easy but the fossil stuff... if there's any damage or anything we have to deal with that as we go. M: Do you have any more books in the works? E: There has been significant interest in a volume two of She Found Fossils. We're trying to figure out if that's feasible right now. There are hundreds of women that are not represented in our first book and I think that's rather unfair, so we would like to do a second volume. But we need to have some support structure in place in order to get that done. A: Okay now we go into that part of the interview that is a little bit more silly. We're going to ask some silly questions and we're going to make you do something really silly. M: What is the dinosaur you are most likely to hold an intellectually stimulating conversation with? E: Does it have to be an extinct dinosaur. E: Okay I'm going to say an African grey parrot! M: I’ve had a lot of good conversations with ravens as well. E: Yeah I was going to say New Caledonian Crow is would probably be my second pick for modern birds. So... fossils. 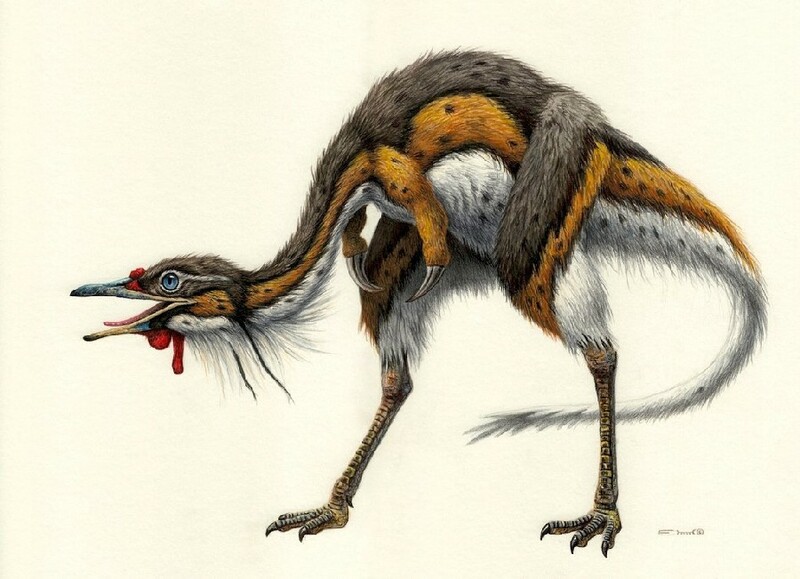 Like, extinct theropods? Is that what you meant? M: We're mammal people we don't really know what that means. A: Speak for yourself! I work at the Museum of the Rockies. A: I guess this was a chattiest dinosaur question. E: I'm going to say Alvarezsaurus. M: Are they the smartest or the chattiest? E: I'm going to say chattiest! A: *desperately trying to show off her dinosaur skills* They’re one of the more not so well-known dinos right? Pretty fragmentary material is all that is present. A: OH. Okay. That’s a bird. M: So they’re not going to be talking with their hands. E: Right. So they I'm assuming they've got a lot to say cuz... that's interesting, not having arms. A: We will have to use that photo and give credit to the artist. And speaking of artists: Clearly we saw from your poster you are a paleo artist. E: Uh.. a very good one? A: Yes. can you depict all of us? E: All three of us? A: All four of us. E: Can I include Abby in there too? A: Yes! 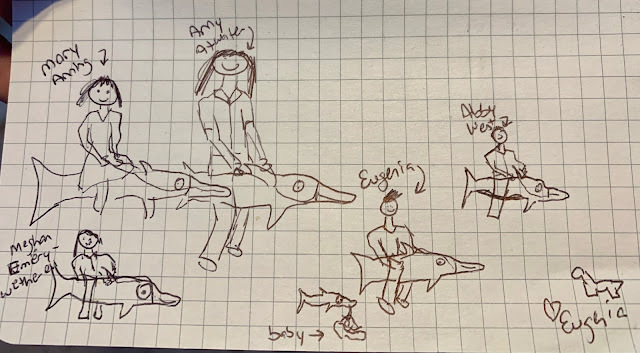 All of us holding hands and riding off into the sunset with Mary Anning on… whatever you want us to ride on. Huh that sounds weird. Ready? GO! M: I feel like I should be timing now. A: when we are all famous this is going to be in the Smithsonian. M: Do you want her to draw you first? M: She has some really strong artistic opinions. Eugenia creating the masterpiece of the century, all while holding her offspring! M: I love how safe you are even in a drawing. A: This picture is so amazing, it’s next level. A: We saw those magic arms and we needed it to come alive again. E: I’m trying to draw something! That’s just rude. Sabotage here. OK, everyone’s wearing pants. And the same shirt. E: Ok. It’s going to be worth millions of dollars! MORE LIKE WORTH TRILLIONS OF DOLLARS!!!! M: there is one last question. Who would win in a chess battle… if you took a bird brain or a horse brain - any form of horse, any form of bird. E: Bird. For so many reasons. No offense to horses. M: Yeah. Which one’s most likely to create Skynet? M: Yeah. They seem real devious. And like they might be real mean, if you give them the chance. 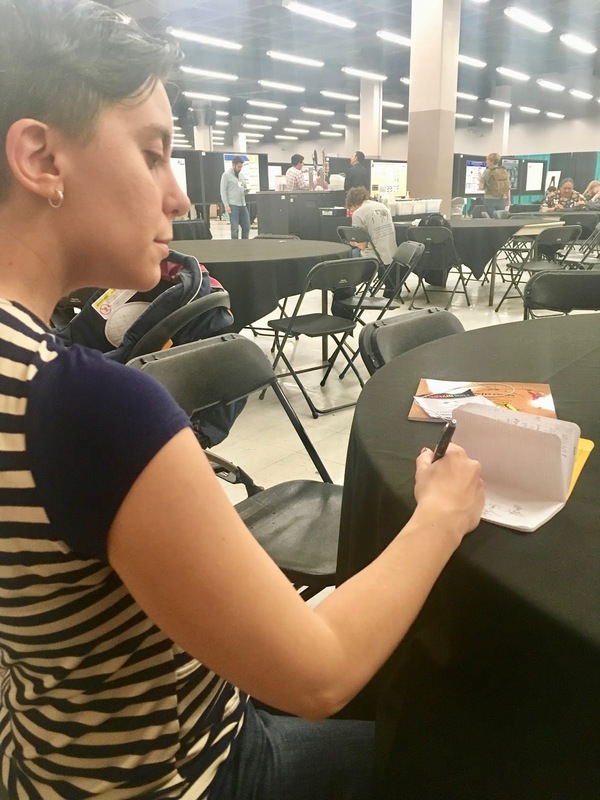 Thanks so much to Eugenia for tolerating all of our ABSURDLY ridiculous questions, and to her daughter for offering key insights. 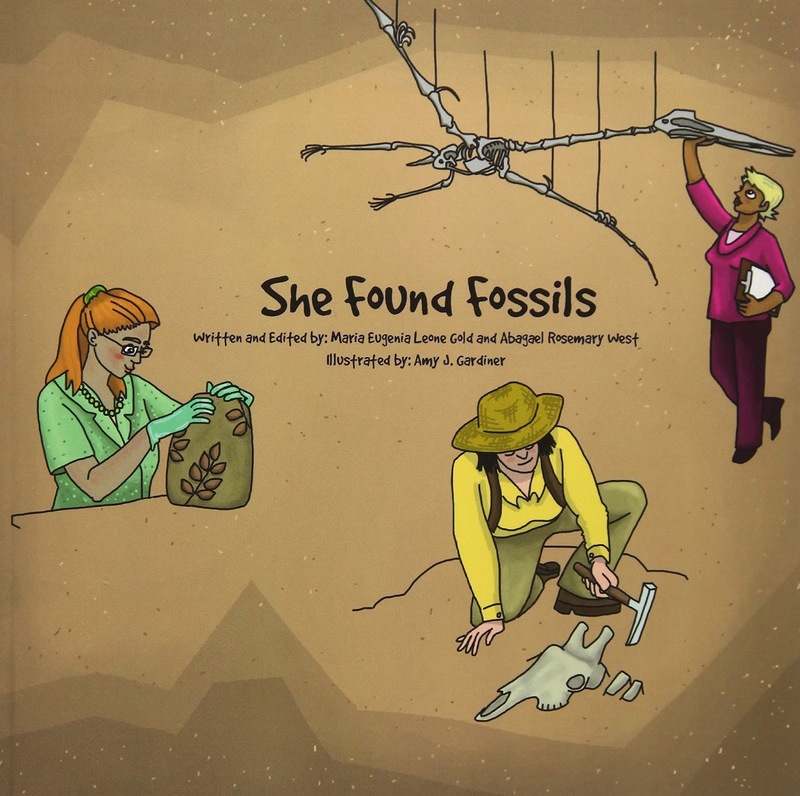 Check out the book “She Found Fossils” here, ready for all your gift giving needs! Happy Women in STEM Day! Yay! Baby comments especially insightful. An amusing & intriguing interview, really enjoyed it. Will be looking for the book. Hope there is a second volume, that's a worthy goal. Hi there! I know this is somewhat off topic but I was wondering which blog platform are you using for this website? I'm getting tired of Wordpress because I've had issues with hackers and I'm looking at options for another platform. I would be great if you could point me in the direction of a good platform.